We now live in a world saturated by self-service technology. There is an ever-increasing desire to see self-service kiosks in a variety of day-to-day locations. Kiosks have the ability to accelerate processes, which is crucial as customers are becoming less tolerant of big queues and waiting times. The consumers are at the forefront of all retail businesses; a happy customer equals a drive in sales. Meanwhile, customers are becoming more expectant of efficient, quality service and a positive shopping experience. In store self- service is becoming the norm, shown by a recent study that reveals 85% of consumers want access to digital content on the shop floor. In the UK, over 66% of people desire self-service at the point of payment to make shopping more efficient. According to a nationwide survey, in which 4,000 shoppers were asked, 95% of people use self-service checkouts, and 65% of people would like to see more self-scan tills in supermarkets. 57% of these people preferred them as they ‘speed things up’, 32% voted reduced queues as the main benefit. In the world of hospitality, there is the perception that kiosks depersonalise customer service, but in reality self-service is reinventing customer experience for the better. They appreciate having more control over their experience with the reassurance of usable self-service technology. In hospitality sector, fast food places are making 35% more money as self-service kiosks prompt customers to add items to their order. Visitor check in is 48% faster and check out is 58% faster using self-service applications in the hotel industry. Passengers want to avoid delays by reducing queuing times and have a stress-free pre flight experience. 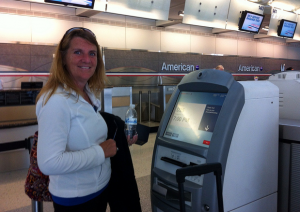 The 2012 SITA Passenger Self-Service Survey found two thirds of passengers interacted with self-service check-in kiosks. 89% of people elected self-boarding and 68% voted the automated bag drop as their preferred self-service aspects in airports. Research reveals that 82% of passengers would choose to book with a travel company that allows check-in online or using a self-service kiosk application. These statistics show that a proportion of the public would still prefer to interact with other humans. Whilst some customers remain traditional in their ways, a large percentage of people are now welcoming multi channel self-service. What type of consumer responds to self-service applications? Self-service allows the consumer to take control and interact at their own pace, which is a novelty to most. In retail for example, kiosks are enabling consumers to explore and browse what a store has to offer, including its product range. With these applications in place, staff are able to focus on other aspects of customer service, leading to a rise in customer satisfaction. With faster paced lifestyles, consumers need timely processes to be sped-up and made a lot simpler. Self-service technology, as a whole, has transformed the customer experience in a plethora of locations.